As part of our veterinary staff, Old Dominion Animal Hospital Receptionists do a lot more than just answer the phone. We pride ourselves on having “real people” on the other end of the phone rather than greet you with a recording. Our receptionists are your link to your pet’s doctor and they treat your questions with care and respect. Our veterinary staff is there to greet you when you come to our animal hospital to assist you and your pet into our examination rooms. They will check your pet’s weight and get the vital information about the reason for your pet’s visit to our animal hospital. Our veterinary staff also maintains your pet’s computerized records, and they are happy to help provide instructions or medications. Feel free to call them anytime you have questions about your pet’s health care. We appreciate the busy and varied work our receptionists perform every day. Sara grew up in Virginia. She has always had a passion for animals. While growing up, her family had several cats, hamsters, mice, fish and turtles. She became an EMT in 2007 and loved taking care of people and helping them in times of need. She feels enjoys doing that now as part of her job as a receptionist. She lives out in the country with her husband, two sons and their dog. In her spare time she enjoys camping, riding on her husband’s motorcycle with him, baking, and decorating. Michele is originally from Johnstown, Pennsylvania. She holds an Associates degree in Travel and Tourism Administration from Pittsburgh Technical Institute. After college, she lived in Orlando, Florida. While there, she worked for Walt Disney World and Westgate Resorts, gaining extensive knowledge in customer service. She moved to Charlottesville, Virginia in 2011 with her husband and daughter, where she has been a stay at home mom. Michele and her family are active in their local Fluvanna 4-H group. She is also a dog mom to an adopted senior rescue named Bradley. It is our practice manager who keeps this animal hospital running every day. We couldn’t function without her! The manager handles all the hiring, training, scheduling, and management of the veterinary staff. She is also responsible for the hospital budget, which includes ordering and stocking the animal hospital with supplies and equipment necessary for us to do our jobs. Our veterinary manager handles all our data and computer systems, oversees the practice performance, and makes sure the entire veterinary staff follows all safety practices. The job requires the ability to be flexible as she might be receptionist one moment and veterinary assistant the next, but that’s part of what makes the job so much fun. 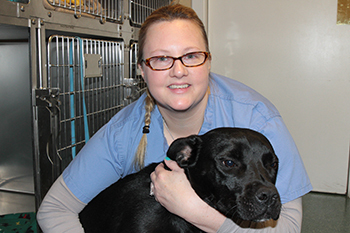 If you ever have any problems at Old Dominion Animal Hospital, just ask to speak to our office manager – she can help. The manager handles all credit policies and client services. Paul Simpson is originally from Gainesville, FL and graduated from Clemson University in 1985 with a Bachelor’s degree in Zoology. He worked many years as a freelance and sports photographer before joining the kennel staff at the Charlottesville-Albemarle SPCA where he eventually became kennel manager. 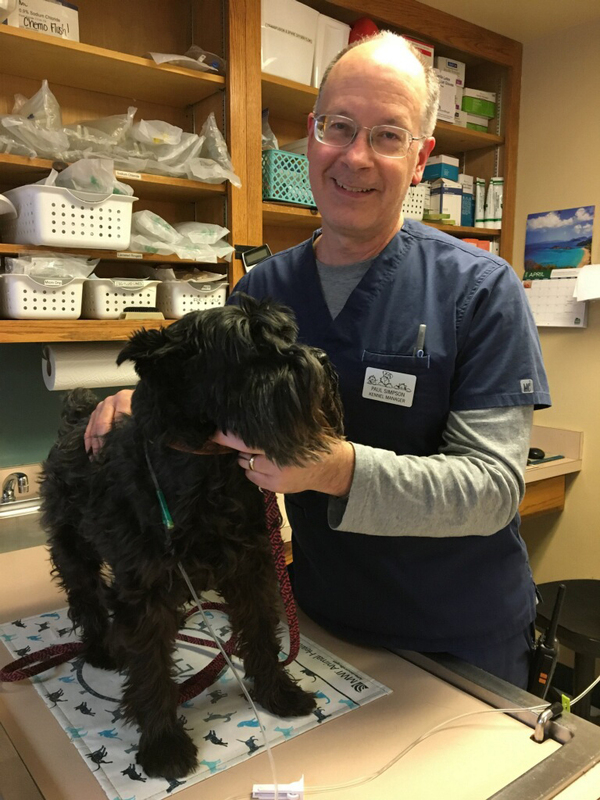 After almost 5 years at the CASPCA he left and joined the staff at Old Dominion Animal Hospital and is currently Kennel Manger. In his spare time he enjoys landscaping, reading, watching movies and Clemson Tiger football with his wife Tricia, and his cocker spaniel (Zoe) and three cats (Liby, Noelle, and Ajax). Our kennel assistants are our real animal caregivers. They take pride in the way they care for your pets while they stay with us. They do everything they can to make your pet’s stay safe and comfortable at our animal hospital. They are the ones who feed, clean, nurse, walk, and play with your pet. Our animal caregivers are often high school or college students who have a keen desire to pursue a career in veterinary medicine. Working at Old Dominion is frequently how they gain their first experience. Old Dominion Animal Hospital is pleased to give these students their first introduction into a wonderful life of caring for animals.